Victoria, BC's Acres of Lions made a name for themselves among Canadian indie rock fans with their irresistibly catchy tune "Reaction". Now the band are on the verge of releasing their follow-up record, Home(s) (out April 2nd). The album opener "Bright Lights" is a peppy track with a great drum beat, building on the promise of "Reaction". The pure pop gem "Old Town" boasts both a strong vocal hook in the chorus, and an outstanding guitar riff. If you are planning a long-haul Canadian road trip this summer, then you will definitely want to make sure "Never Let Me Go" is on your playlist. It's a hook-filler rocker that will have you singing along as you barrel down the Trans-Canada. The '90s Emo influence can be both a positive and a negative on the record. When it works, like on "Better Luck Next Year", it's a melodic midtempo number. When it fails, as on "Great Escape", it's because those melodies are absent, leaving superficial lyrics and listless arrangements to stand alone. "Writing From the Heart" is a frustrating effort with a chorus that never quite hits the stride that is promised in the verses. "Miserable Together" strikes a nice balance. The song is heavyhearted at its core, with a lighthearted surface that can't help but make you smile. The closer "Signs and Wonders" breaks the mold, offering up a toe-tapping strum before transforming into a call-to-arms. Home(s) is a decent pop rock record, one with some lofty highs. It just fails to consistently deliver on the band's potential. 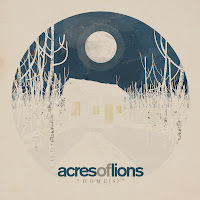 Acres of Lions play the Dakota Tavern in Toronto on March 21st as part of Canadian Music Fest. Best tracks: "Never Let Me Go", "Bright Lights"